ArgoMoon is a 6U CubeSat, developed for the Italian Space Agency by Argotec as design authority, that will be launched onboard the NASA Space Launch System (SLS), during the Exploration Mission 1 (EM-1). The primary goal of the mission is to take detailed photographs of the SLS secondary propulsion stage: the pictures will be collected by ArgoMoon during a proximity maneuvering phase, that will also allow to validate the tracking algorithm developed by Argotec. After that, orbital maneuvers will move the satellite in a geocentric highly elliptic orbit, whose apogee is so high to allow flybys and imaging of the Moon and surrounding environment. ArgoMoon has been designed to operate in Deep Space, with the additional possibility to take images of the Moon and Earth surfaces, performing multiple propulsive maneuvers and communicating with Earth from long distances. The highly demanding mission environment required to implement design strategies driven by the newest trends and technologies available in the commercial space businesses along with new approaches focused on lean design and project development. This presentation provides an overview on the design of the satellite focusing on the main technological challenges and lessons learned during the development of a CubeSat for Deep Space mission. 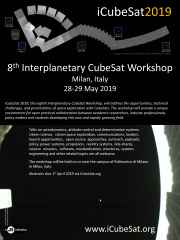 This experience demonstrates the importance of one of the main topics for CubeSats: the trade-off between performances, reliability and costs, with attention to the applicable standards and normative.